Asheville Restaurant Week is a special treat — not just for locals, but also for wintertime visitors to the North Carolina mountains. What better way to sample the awesome food from the Asheville area? From January 19 through January 28* (yes, it’s more than a week, we like our weeks to stretch out here in the mountains), you can dine at dozens of restaurants that will be offering special menus ranging in price from $15-$30 per person. * Update (Jan. 26): Asheville Restaurant has been extended to February 1, due to the wintry weather we had over the weekend. among others. For an example of what to expect, see Posana’s delicious Restaurant Week menu of three courses for $30. 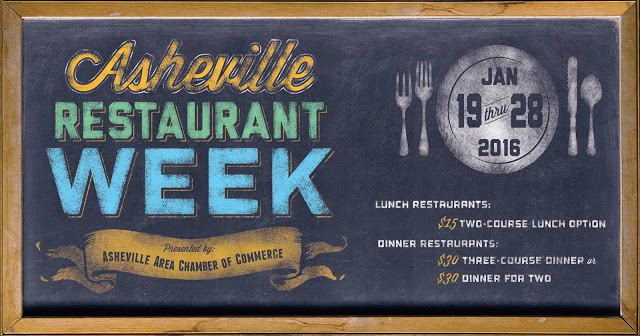 There is a reason that Asheville is consistently mentioned across the globe on lists of fabulous dining hotspots… Asheville Restaurant Week is a great way to discover what distinguishes this vibrant foodie destination from the rest. See a full list of the participating restaurants at www.exploreasheville.com/restaurant-week. This entry was posted in Asheville Festivals and Events and tagged Asheville, festivals and special events, food and drink, Winter by Inn on Mill Creek. Bookmark the permalink.